Annuals or biennials; puberulent or glabrous, (trichomes cylindrical). Stems simple from base, erect, branched distally, (1-)2.5-5(-6.5) dm. Basal leaves (early withered); rosulate; petiole 0.5-1.5(-2) cm; blade oblanceolate, spatulate, or oblong, (1.5-)2.5-8(-11) cm × 5-10(-20) mm, margins coarsely serrate or pinnatifid. Cauline leaves shortly petiolate; blade narrowly oblanceolate or linear, (0.7-)1.3-6.2(-8) cm × (0.5-)1.5-10 (-18) mm, base attenuate to cuneate, not auriculate, margins usually entire or irregularly serrate to dentate, rarely pinnatifid. Racemes considerably elongated in fruit; rachis puberulent, trichomes straight, slender to subclavate. Fruiting pedicels divaricate-ascending to horizontal, straight or slightly recurved, (terete), (1.5-)2-3.5(-4) × 0.15-0.25 mm, puberulent adaxially. Flowers: sepals oblong, 0.5-0.8(-1) × 0.3-0.5 mm; petals (absent or rudimentary) white, filiform, 0.3-0.9 mm, claw absent; stamens 2, median; filaments 0.6-1(-1.8) mm; anthers 0.1-0.2 mm. Fruits obovate to obovate-suborbicular, (2-)2.5-3(-3.5) × 1.5-2.5(-3) mm (widest beyond middle), apically winged, apical notch 0.2-0.4 mm deep; valves thin, smooth, not veined, glabrous or sparsely puberulent (at least on margin); style 0.1-0.2 mm, included in apical notch. Seeds ovate, 1.1-1.3 (-1.5) × 0.8-0.9 mm. 2n = 32. Flowering May-Jul. Waste places, disturbed sites, prairies, fields, pastures, grasslands, chaparral, meadows, sagebrush flats, flood plains, gravelly hillsides, rock crevices, seashores, sandy places, shaley barrens, open mesa, roadsides; 0-3500 m; Alta., B.C., Man., N.B., Nfld. and Labr., N.W.T., N.S., Ont., P.E.I., Que., Sask., Yukon; Ala., Alaska, Ariz., Ark., Calif., Colo., Conn., Del., D.C., Fla., Ga., Idaho, Ill., Ind., Iowa, Kans., Ky., La., Maine, Md., Mass., Mich., Minn., Miss., Mo., Mont., Nebr., Nev., N.H., N.J., N.Mex., N.Y., N.C., N.Dak., Ohio, Okla., Oreg., Pa., R.I., S.C., S.Dak., Tenn., Tex., Utah, Vt., Va., Wash., W.Va., Wis., Wyo. ; Mexico (Chihuahua, Nuevo León); introduced in Europe, Asia. 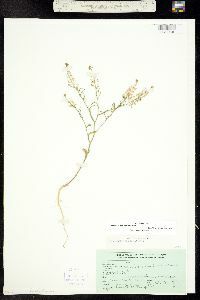 North American records of Lepidium apetalum Willdenow mostly represent misidentifications of L. densiflorum. The latter has obovate fruits widest beyond the middle, whereas L. apetalum has elliptic fruits widest at the middle. 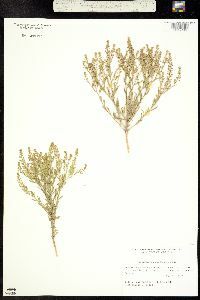 The number and limits of the varieties recognized in Lepidium densiflorum, as well as the characters used to delimit them, vary among authors (A. Thellung 1906; C. L. Hitchcock 1936; G. A. Mulligan 1961; R. C. Rollins 1993; N. H. Holmgren 2005b). The variation almost always does not correlate with geography, and the recognition of varieties in this species is neither practical nor very useful. All of those authors admitted that these varieties are 'very weak at best' (Rollins, p. 554). Of them, perhaps var. pubicarpum (including var. elongatum) might merit recognition. It is distributed in almost all of the Mountain and Pacific states and is distinguished from the other varieties solely by the presence of trichomes or minute papillae on the fruit valves. The density of these trichomes ranges from moderate and covering the entire valve surface to very sparse and represented by individual papillate trichomes restricted to the valve margin. Furthermore, the length of these trichomes may vary from ca. 0.01 to 0.3 mm. In some species (e.g., L. dictyotum) both glabrous- and pubescent-fruited forms occur, yet none of the above authors gave formal recognition to both forms. It is not known if both glabrous and puberulent fruits occur within the same population in L. densiflorum. The species is autogamous, but nothing is known about the rates of gene flow between and within populations. Annual or biennial herb 20 cm - 0.5 m tall Stem: upright, sparsely short-haired. Flowers: in long, branched clusters (raceme). Racemes 5 - 10 cm long. Petals four or none, white, 1 - 2 mm long (shorter than the sepals), linear to narrowly spatula-shaped. Stamens two. Fruit: a small pod, 2 - 3.5 mm long, nearly or almost as wide, rounded, flattened, tips notched, narrowly winged above. Seed one on each side. Basal leaves: 4 - 7 cm long, coarsely toothed to pinnately lobed, sparsely short-haired. Stem leaves: alternate, not clasping, shorter than basal leaves, less than 1 cm wide, linear or narrowly reverse lance-shaped, tips sharply pointed, mostly non-toothed, sparsely short-haired. Similar species: Lepidium latifolium is similar but has lance-shaped to narrowly egg-shaped leaves that are sometimes over 1 cm wide. 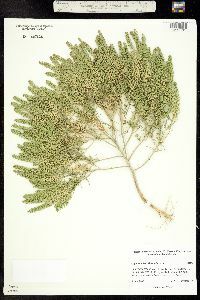 Lepidium ruderale is a foul-smelling plant with twice pinnately divided basal leaves. Lepidium virginicum is also similar, but differs by having flower petals equal to or nearly twice as long as the sepals. 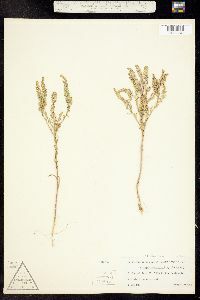 Habitat and ecology: The origin of this plant is uncertain. It was probably introduced from Eurasia. Locally common in railroad ballast and waste ground. Also found in fields, pastures, and along roads. Grows in dry to moist soil. Etymology: Lepidium comes from the Greek word lepis, meaning scale, which refers to the shape of the fruit. Densiflorum means "densely flowered." 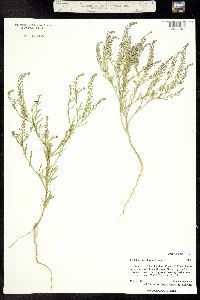 This species is probably local or frequent throughout the state in habitats similar to those of Lepidium virginicum from which it can sometimes be separated only with difficulty. 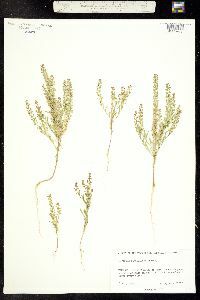 Duration: Annual Nativity: Native Lifeform: Forb/Herb General: Annual to biennial herbs, 10-65 cm tall, from slender taproots; stems erect, usually solitary and simple at the base, branching distally; herbage puberulent to glabrous; plants with pungent, watery sap. Leaves: Basal leaves in a rosette, early-withering, on 1 cm petioles; stem leaves alternate, shortly petiolate or sessile; blades oblanceolate (basal) to linear (upper), 1-11 cm long and 1-20 mm wide, the margins coarsely serrate to pinnatifid or entire (upper leaves). Flowers: White, very small and inconspicuous, in long narrow racemes at branch tips, the rachis (center stalk of the raceme) puberulent and the pedicels spreading in fruit, straight or slightly recurved, 2-4 mm long; sepals 4, oblong, 1 mm long or smaller; petals 4, rudimentary, less than 1 mm long, filiform and forming a cross, white, sometimes absent. Fruits: Capsules flattened, obovate to suborbicular, about 2-3 mm long and 2-3 mm wide, with a shallow notch and persistent style at the tip; seeds brown, ovate 1 mm long. Ecology: Found in waste places, disturbed sites, prairies, fields, pastures, grasslands, chaparral, meadows, sagebrush flats, floodplains, gravelly hillsides, rock crevices, seashores, sandy places, shaley barrens, open mesas, and roadsides, below 11,500 ft (3505 Distribution: Found throughout N. Amer. ; naturalized in Asia and Europe. Notes: Lepidium is a genus in the mustard family with distinctive small, round, flat seed pods and small white flowers. 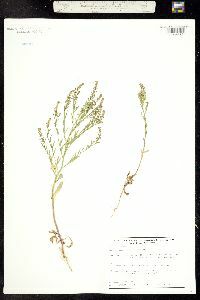 L. densiflorum is distinguished by this combination of traits: plants are taprooted annuals or biennials; stems and leaves are glabrous or lightly hairy, not hirsute or covered with scurfy scales; upper stem leaves are sessile but not clasping the stem; racemes are erect and located at branch tips, with hairy rachises (center stalks of the racemes), and fruiting pedicels that are not noticably flattened; flowers lack petals or have tiny white petals less than 1 mm long, and have only 2 stamens; seed pods are about as wide as they are long, and not wrinkled. Ethnobotany: Used medicinally to treat people who have swallowed an ant, for kidney problems, and for headaches; also used as an infant sedative by rubbing the plant on an infant's face. 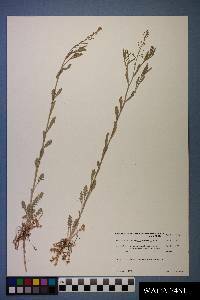 Synonyms: Lepidium elongatum, Linnaeus neglectum, Linnaeus pubicarpum, Linnaeus ramosum Editor: LCrumbacher2012, AHazelton 2017 Etymology: Lepidium comes from the Greek lepidion, meaning "a little scale," in reference to the flattened shape of the seed pods; densiflorum means densely flowered.